Sonnet’s SF3 Series - SxS Pro Card Reader fills the bill. Featuring a 40Gbps Thunderbolt™ 3 interface, this device quickly ingests footage from SxS memory cards to any Mac® or Windows®(1) computer with Thunderbolt 3 ports—on location, in the studio, or in the edit suite—at the fastest speeds the cards will support. Compact, Rugged, Stackable—Aluminum enclosure for rugged and reliable operation. Stackable design enables multiple SF3 Series card readers to occupy same footprint. The SF3 Series - SxS Pro Card Reader is the industry’s first SxS card reader for Thunderbolt 3. This dual-slot reader takes advantage of Thunderbolt 3’s 40Gbps bandwidth to ingest files simultaneously from two cards at maximum speed—more than double the average ingest speed of USB 3.0 card readers. Using the Sonnet SxS reader enables you to ingest footage from multiple cards in much less time for a significantly more efficient workflow. The SF3 Series - SxS Pro Card Reader includes two Thunderbolt 3 ports; the first connects it to your computer, while the second supports daisy chaining of up to five additional Thunderbolt peripheral devices(2) to a single port on your computer. The reader includes 10Gbps USB 3.1 Gen 2 support, meaning you can connect a USB device to the second port using the proper cable or adapter. The SxS reader also provides full support for connecting up to two 4K displays @ 60Hz or one 5K display @ 60Hz(4). For connected devices requiring extra power, 15 watts is provided to bus-powered other devices, such as the SF3 Series – CFast 2.0 Pro Card Reader. 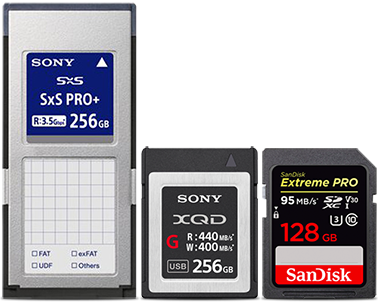 The SF3 Series - SxS Pro Card Reader supports all generations of SxS media, up to the latest E Series cards. When used with proper adapters (sold separately), you can even use XQD and SDXC cards with this reader. The SF3 Series - SxS Pro Card Reader—measuring a compact 5.75 inches wide by 1 inch high by 5.1 inches deep—is suitable for use in any workspace. The reader’s extruded aluminum shell makes it lightweight, yet rugged enough to be transported in an equipment bag without fear of damaging the case. 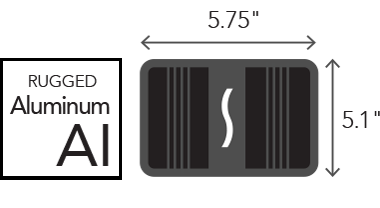 SF3 Series card readers are designed to be stacked, allowing multiple readers such as additional SxS Pro Card Readers and Sonnet's CFast 2.0 Pro Card Readers to occupy the same footprint. 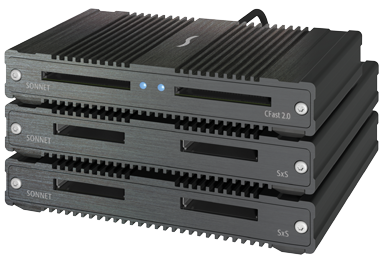 The SxS reader enables you to daisy chain multiple readers to ingest four, six or more cards simultaneously, taking advantage of Thunderbolt 3’s 2,750 MB/s bandwidth. 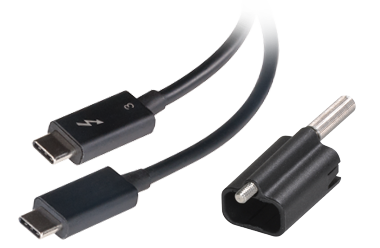 Sonnet includes a 0.5-meter Thunderbolt 3 cable to connect the SF3 Series - SxS Pro Card Reader to your computer, and a Sonnet ThunderLok 3 Thunderbolt connector retainer clip(5) to secure the cable to the reader. Accidentl cable disconnect can lead to data loss. Sonnet’s ThunderLok 3 secures the Thunderbolt cable to the SxS reader, and is easy to install and use—just slide it over one end of the cable, and then plug in the connector and secure it to the reader by turning a thumbscrew. Because of its unique design, ThunderLok does not attach to the connector, but remains on the cable so it won’t get lost when not in use. XQD and SDXC card adapters sold separately. One 4K monitor directly supported. Two 4K monitors requires either a 4K monitor with multi-stream transport support (DP out), or a Thunderbolt 3 to Dual DisplayPort adapter. 5K monitor requires a Thunderbolt 3 to Dual DisplayPort adapter.